As NRC notes, the earlier reports from the Washington Post had estimated about 20,000 successful “implants” in 2008. So it appears that the NSA has more than doubled its malware installations in the past four or five years. Of course, looking at the chart, you can see some interesting tidbits. The blue dots are “Large Cable,” which appears to be key fiber optic cable endpoints that they’ve tapped into. From the description it appears some of those taps are “covert,” while others are “cooperative” (thanks, AT&T!). 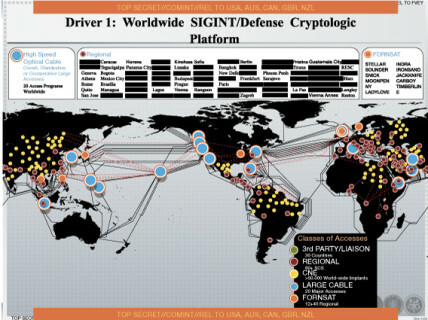 CNE is “Computer Network Exploitation” and you can see that targeted in areas of interest. A bunch in China and India. A lot in the Middle East. A bunch in Russia and then Mexico and South America. Basically, the NSA has access to… just about anything it wants.